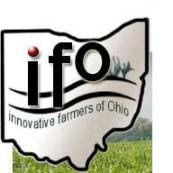 The Innovative Farmers of Ohio (“IFO”), a farmer led non-profit organization serving Ohio, is bringing its annual conference to the city of Athens this Friday and Saturday and Rural Action wants to help you take advantage of this important and informative event. A two day event, stacked to the rafters with tours, workshops, and even live music from the Backporch String Band, Innovative Farmers of Ohio is teaming up this year with Rural Action to provide a discounted conference registration fee of $35.00 to all current Rural Action members. 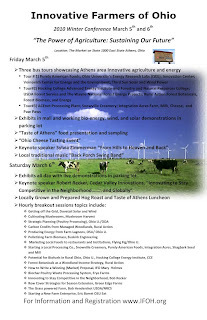 With dynamic speakers, sessions on alternative energy, local foods, and waste management (just to name a few), along with three sensational tours including Snowville Creamery, this conference is a valuable resource for the anyone working the land they love. Check out the flyer below for full (and we mean full) details on the agri-packed two day event! Registration for this year's conference includes: Friday tours, Taste of Athens Food Event, Ohio Cheese Tasting, Friday Night Keynote and Entertainment with the Backporch Swing Band, Saturday breakout sessions, Hog Roast Lunch, Saturday Keynote Address. Continental Breakfast and entrance to exhibits, both days. 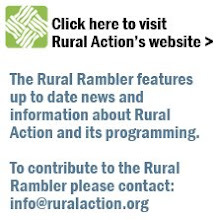 To register through Rural Action, click here for the 2010 Winter Conference. If your Rural Action membership has lapsed, we will invoice you at the $20 individual membership rate. Our online secure server accepts payments via Paypal or credit card and you do not need a Paypal account to make a payment through the service. If you'd prefer to pay by check, just call Rural Action's own Jordan Vincent at 740.767.4938. After completing your registration, you will receive an form via email for you to indicate your first and second choice of conference bus tours as seating is limited on some tours. Don't miss out on this valuable resource for the farmer of today and tomorrow, sign-up and find out where the future of farming can take you!